Looking for a memorable San Diego gift? We offer convenient gift certificates for brunch and nightly dinner cruises, craft beer dinner cruises, Sunday prime rib dinner cruises and special holiday cruises. A Flagship cruise is the perfect gift idea for friends, family, business contacts, and anyone who deserves a special treat. Gift someone the beauty of San Diego Bay, the thrill of cruising on a luxury yacht, and Flagship’s first-class service all rolled into one. 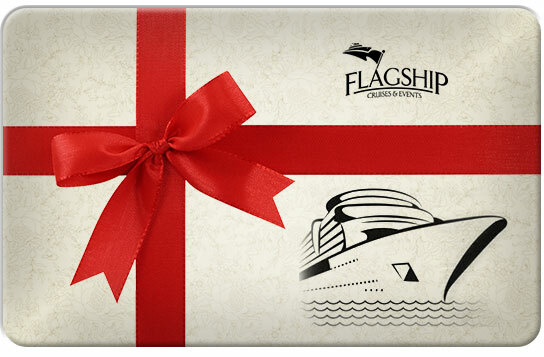 Order a Flagship gift certificate today! Gift certificates may be purchased via telephone or in person at our ticket booth at 990 N. Harbor Drive. Telephone orders can be shipped free via certified mail or picked up at the ticket office. Please allow 4-6 business days. Expedited shipping available. Contact us if you have any questions.